Innovation, flexibility, style – just three of the many words that describe IRONWORKS, a unique and inspiring offering of commercial real estate for sale in Vancouver, BC. A rare opportunity to acquire ownership in a flagship commercial development in Vancouver, IRONWORKS is located at 220 Victoria Drive, in the heart of the growing Port Town community of East Vancouver. This is a place that thrives on hard work; where entrepreneurial spirit and neighbourly values converge. 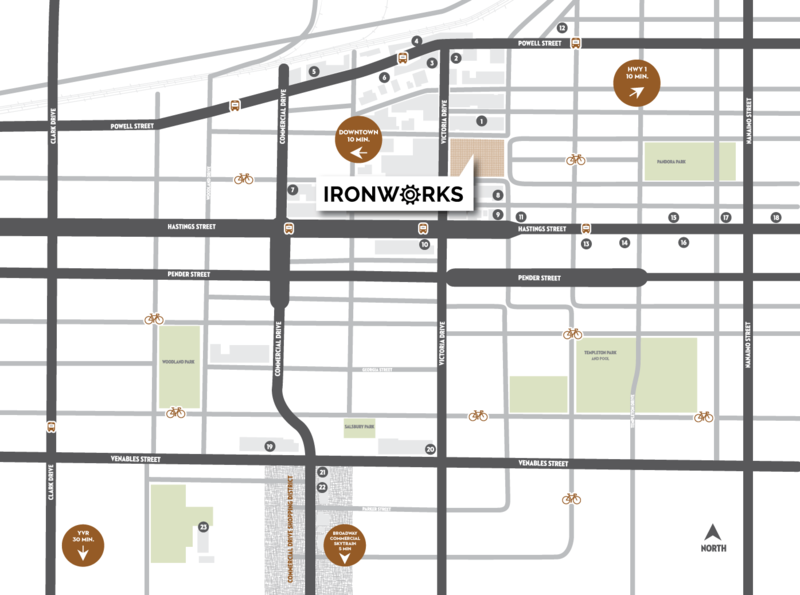 IRONWORKS sets the standard for commercial real estate, with both office and warehouse spaces available for purchase. Meticulously designed to meld flexible use of space and functional design, with a modern flair that inspires vision and creativity, IRONWORKS is where successful entrepreneurs want to build their legacy. IRONWORKS is where you want to be! Considering commercial real estate for sale in Gastown, East Vancouver, or other areas near downtown? IRONWORKS will check the boxes on your wish list, and then some. 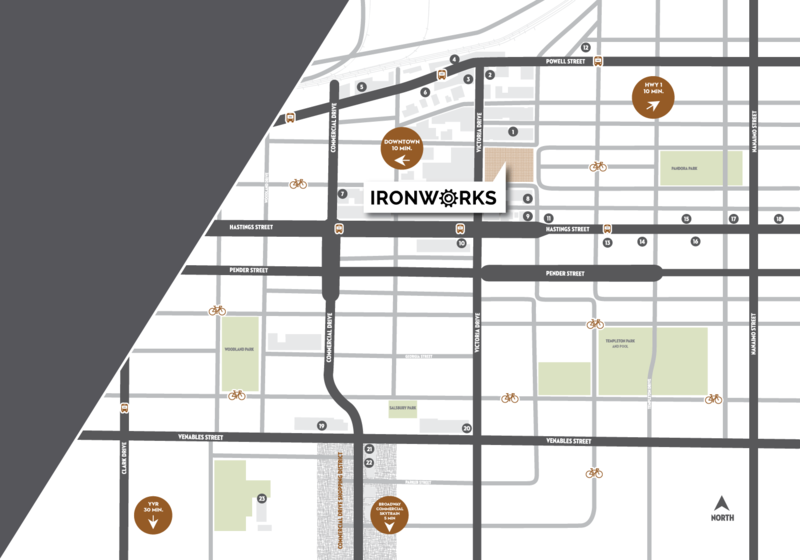 Backed by stunning views of Burrard Inlet and the North Shore mountains, IRONWORKS is one of the most progressive and flexible offerings of commercial real estate for sale in Vancouver, building on the rich history of this unassuming, yet bustling neighbourhood. There is no shortage of amenities in this unique neighbourhood. Grab a coffee and a quick breakfast from a nearby bakery. Do business over lunch along Commercial Drive or Hastings. Relax with an after-work beer at one of the East Van craft breweries. The possibilities are endless to fulfill your work-lifestyle balance, right here in Port Town. Contact us to learn more about purchasing space for sale at IRONWORKS, Vancouver’s premier mixed-use commercial real estate opportunity. *I agree to allow Ironworks Developments Ltd. and Cushman & Wakefield, on behalf of Ironworks to contact me and send me updates by phone or email.